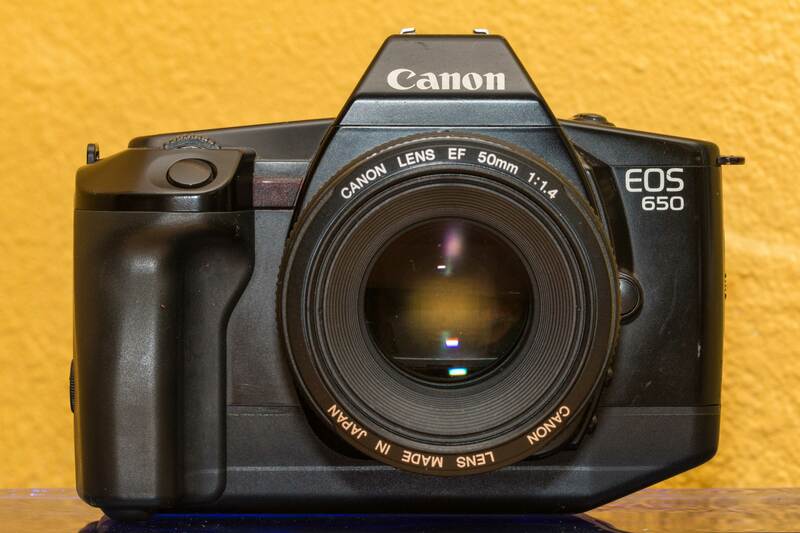 Canon EOS 650 with EF 50mm f/1.4 USM. 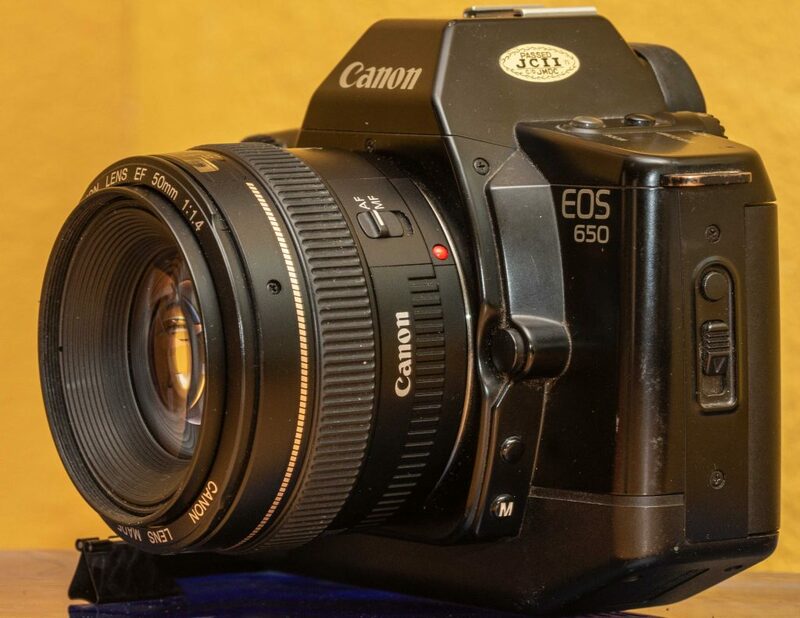 The Canon EOS 650, released in 1987, was the first camera to bear the EOS name; with it came a revolution in photography. While autofocus at the time has been around for a few years, Canon innovated by putting the focusing motors inside the lens, and making the aperture controls completely electronic. By eliminating all mechanical linkages between the body and lens, Canon invented a system that’s faster, more accurate, and most importantly, forever expandable; all new EF lenses released today will not only fit right on, they will just work, with no caveats! In addition to being the first EOS camera of all time, this camera also marked the beginning of the end for Nikon’s dominance in the professional field, since Nikon couldn’t at the time get autofocus to be as fast or as accurate as Canon could; the reason for that is because Nikon decided to keep the same lens mount, and have the autofocus motor inside the camera body instead of inside the lenses. Canon says that because the motors are inside the lenses, each lens can have a motor optimized for it, leading to speedier, quieter, and faster autofocus operation. Before the 650 – and the EOS system – Canon was the amateur brand, while Nikon reigned king in the professional world. 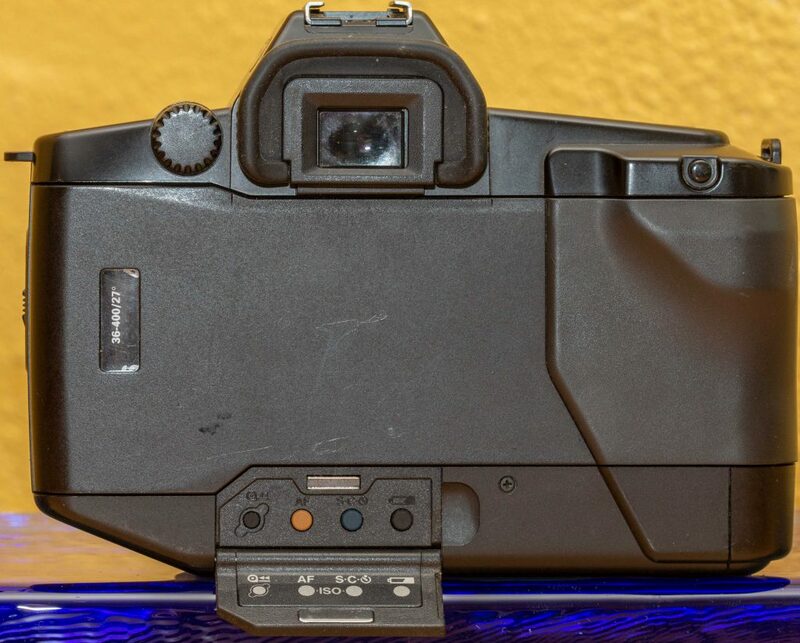 Canon had the manual focus only FD system – and when the autofocus revolution came about during the 80s, decided that instead of modifying the FD mount to accommodate autofocus, decided to throw the whole system away and start fresh. Nikon couldn’t do that since pros had a lot of expensive F mount glass – and decided to make autofocus work with the current mount – by using a motor inside the body to mechanically drive a lens’s focusing system and aperture, in contrast to Canon’s all electronic approach of using electronic motors inside the lenses to control both aperture and focusing. The 650 also was the camera to shoot the first image ever put on the internet. The camera body itself is made of a high-quality plastic. It’s not heavy compared to other cameras, but it’s certainly not as light as a Rebel. The shutter is a metal focal plane – with a vertical travel. It’s made up of multiple segments; take care not to touch them, for if they become damaged, your shutter will need to be serviced. In comparison to other 35mm cameras, I’d say that the build quality is where it should be for a top level amateur camera. EOS 650, rear; the magnetic door is open, showing the four buttons underneath. Looking at the camera, you’ll notice that there’s very few buttons – in fact, you get just ten, including the shutter release! You also only get two dials – one of which is the power dial. Ergonomics are top notch; since everything is electronic, the designers made the camera in a shape that just fits in your hand very comfortably. The shutter button falls right on your right index finger; the only adjustment dial is also controlled using the same finger. You use your left thumb to actuate the depth of field preview button, and if you elect to use the manual mode, the manual button (more on this in a bit). Because of, and despite it being the first EOS camera, all EF 35mm/”full frame” lenses from 1987 until today and beyond just work! AF, IS, everything – it all works fine here, no hiccups. The only thing that doesn’t work is the new EF 70-300 Nano USM’s digital focus scale/gauge; I got that tidbit from Ken Rockwell, and have not yet confirmed it myself, mind you. I can get confirmation soon. 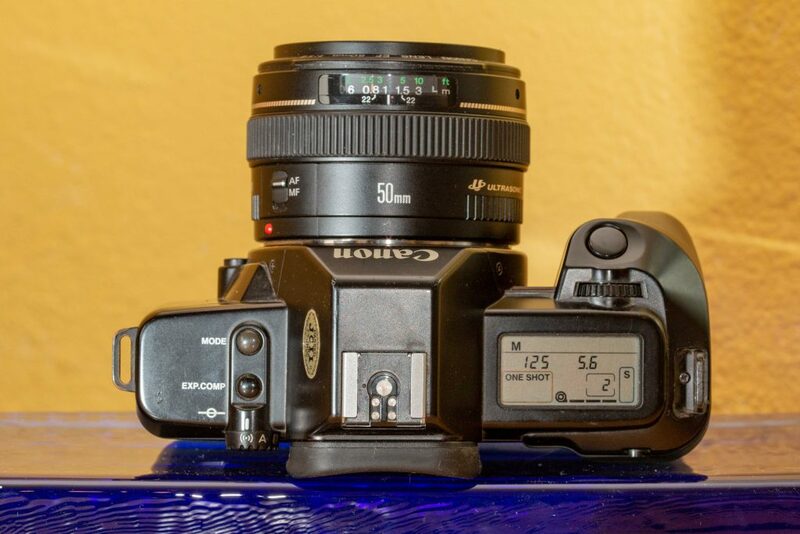 Chances are that if you’re reading this and are shooting on Canon, you have a fixed 50mm – considering that Canon never made an EF-S 50mm, whatever lens you have will work. 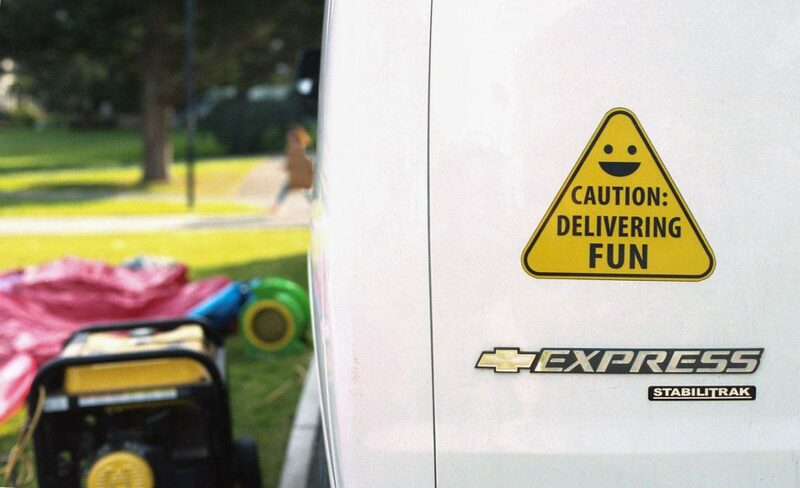 If not, you can get the new EF 50mm STM for $125 new, or less online. There are also plenty of other great EF lenses you can find for cheap if you look on Craigslist or eBay. The beauty of this camera is of its extreme ease of use; when you get yours, you simply load a new battery, pop the back off and load your film, drag your film to the orange dot, and turn the camera on – and then you’re ready to shoot! There are no menus or custom functions or anything like that to waste your time piddling with – or to get in the way of you and a great picture. Top, showing the LCD in operation. The LCD on the top of the camera isn’t backlit (it was from the 620 onwards), but is big and clean. It tells you what mode you’re in, what shutter speed and aperture value is selected, which AF mode is selected, what drive mode is selected, exposure compensation, and finally what number the next frame that will be exposed is; ie when you first load film, the frame counter will read “1”. The EOS 650 reads DX film, so ISO and exposure count are set as soon as you load the film. If you want to shoot at a different ISO, simply open the rear door and press down on the two middle buttons: the top LCD will then read “iso” and the current speed is displayed; you simply use the control dial to adjust, and tap the shutter button to confirm. Short: autofocus has achieved focus. Repeated long: camera shake warning. The shutter speed has fallen below 1/focal length. 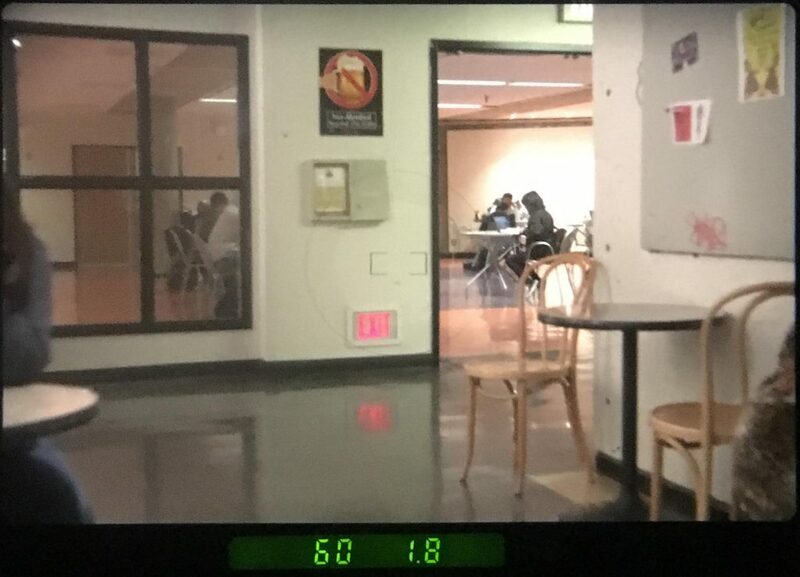 Actual view through the 650’s finder. Through the big and bright viewfinder, you’ll notice how clean it is; the only things that are on it is the singular AF point in the smack middle of the frame, and a ring around it that represents the spot metering area, if you elect to use spot metering. Along the bottom, you’ll see shutter speed, aperture value, and the AF lock indicator when the center AF point is in focus. The viewfinder has 94% coverage, both vertically and horizontally. The 6-segment evaluative meter is used by default. To use the semi-spot meter, press and hold the singular button on the top right with your right thumb; you’ll see * in your finder, and the meter will read from within the circle surrounding the autofocus point in the finder. I’ve not had a need to use the spot meter, so I can’t tell you much about it. You get one autofocus point, right in the center of the frame. Compared to my EOS 70D, it’s a bit slower using the same lenses and easily gets confused with subjects that lack contrast, like skies – but it’s more than fast enough for most photography. When you want something that isn’t in the center of the frame to be in focus, simply aim at it with the center point, lock focus, recompose, and shoot. Simple. Single Shot, as its name implies, focuses and locks exposure at a given point in time and then lets you shoot. It won’t let you fire the shutter before focus is achieved. Servo tracks a subject and continuously adjusts the focus. You can fire the shutter whether or not the subject is actually focused. I leave mine on Single Shot. Being an all electronic camera, winding is of course automatic. When you expose the last frame, the camera automatically starts winding – the top LCD will count the frames down as they are wound, and when that’s complete, the roll icon will blink and the shutter will lock until you open the back. There are two drive modes, Single and Continuous. Single exposes a single frame. Continuous lets you shoot at 3FPS courtesy of the built in motordrive. Considering that there are better film SLRs out there for sports, such as the 1V, I use Single. 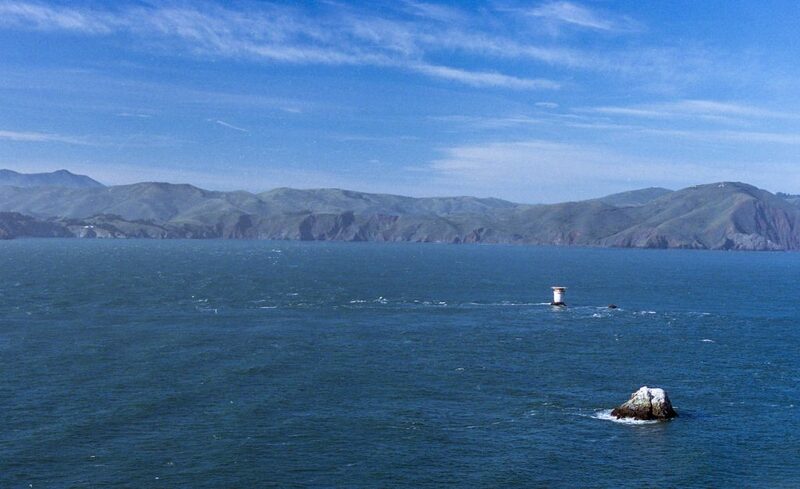 Maximum shutter speed is 1/2000 of a second; it’s on the slower side. Trigger pull and feedback is very well controlled – this will allow you to have a better chance at slower shutter speeds. When you fire the shutter, you’ll hear the mirror briefly followed by the pleasing sound of the motordrive working. It takes a single 2CR5, which you can find at any electronic store. The user manual says it’s good for 100 rolls of 36; I’ve not shot enough to confirm. You can press the bC button on the rear, underneath the door, to display the remaining life: the top LCD will show bC and the remaining life will be displayed in the three segments used to represent the film; each segment represents approximately 33% of charge. [ L ] – Locked shutter, the camera is off. A – Activated, the camera is on. There is no beeper. All shooting settings are recalled from the previous use. [(-)] – Same as A but the beeper is activated. Most of the time, I use the beeper, so I turn mine to [(-)]. You get the following modes: full automatic, program AE, aperture priority, shutter priority, full manual, and a depth of field priority mode (which I will explain in a second). All of my shooting tends to do with depth of field, so I leave mine on aperture priority; the main dial changes aperture value. Shutter priority works in the same way, except the dial changes shutter speed. It’s important to note that program AE on the 650 is not shiftable, while on the slightly newer 620 it is. If you like use program AE, get a 620; it’s basically the same camera, but adds a shift-able program AE, multiple exposures, a faster (1/4000) shutter speed, and removes the DoF mode. Left hand side, showing the Manual exposure button – and above that, the DoF preview button. “CL” – CLose the aperture, your exposure is too high. “Op” – OPen the aperture, your exposure is too low. Of course, if you’re wanting to use a certain aperture, you then have to select a new shutter speed and do the whole process over again. In short, just don’t bother with manual; any one of the AE modes should be more than sufficient. Point the one AF point of your camera at the closest element in the foreground and half press the shutter; the camera will then focus and lock onto the subject. A “1” will be displayed in your viewfinder. Afterwards, point the one AF point of your camera at the furthest element in the background; the camera will then as before focus and lock onto it. A “2” will be displayed on the finder. Finally, recompose the photograph; the camera will then pick an aperture value that will get everything between the points in focus – and the corresponding shutter speed to go with it. This feature proved so popular that the slightly improved version of the 650 released a few months later, the EOS 620, omitted it entirely, and I’m not sure if it made a comeback since. Below are the subjects that I’ve shot with the 650; I’ll update this as I try it out with different genres. For landscape photography, the 650 is a nice camera to use; being made of plastic, it’s light so carrying it for long periods of time isn’t a pain in the back. The clean, bright viewfinder makes composing easy, and you can easily confirm depth of field using the preview button. Autofocus, however, sometimes has trouble locking on to subjects with little contrast in the distance; the solutions consist of either locking onto a subject with contrast that’s very far away (so the camera gets to infinity focus) and then recompose, or help the camera out with lenses with instant manual override. Street photography is lovely with the 650; with the quick autofocus system and light weight, I can carry mine around all day and just keep shooting. Candids of people are also simple because of the autofocus system; instead of having to manually focus, you just compose and let the camera do the rest for you. For shooting events, the 650 is a winner – again, thanks to the autofocus system and evaluative meter. The nice part is that, given their low cost, you can easily and cheaply buy two – load one with black and white and the other with color – or do what pros do and have one with a short lens, such as the 16-35 f/4L, and the other with a tele, such as the 70-200 f/4L. If you’re shooting on Canon’s dSLRs and wanted to start playing with film, this is the camera to get. You’ll most likely have a 50mm EF lens (in retail, I’ve learned that this is the easiest lens to attach, given that people are fooled by aperture size and price) so you already have a lens in which to use with it – and 50mm is a nice walk around focal length on 35mm. These 650s go for $20-30 on eBay and Amazon; you can use the rest of the savings on things that matter, like lenses – or more film. Note: click on any of the images to see the full sized version on my Flickr. 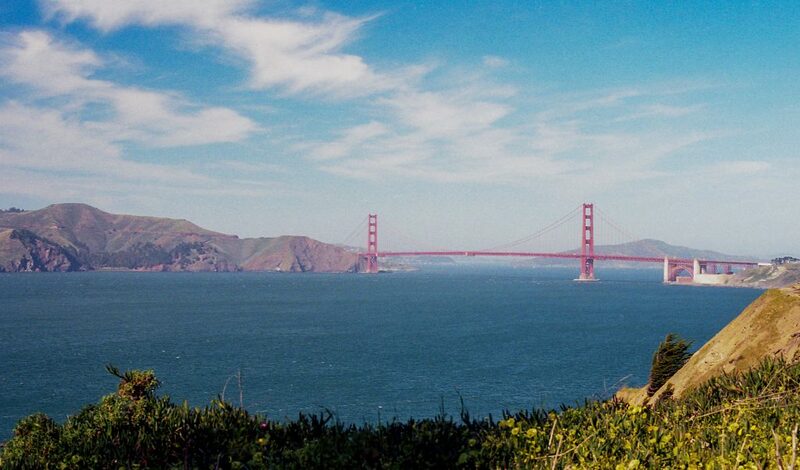 “Golden Gate 3” – EOS 650, Canon EF 50mm f/1.4, Portra 400. “Headlands 1” – Canon EOS 650, Canon EF 50mm f/1.4 USM, Portra 400. 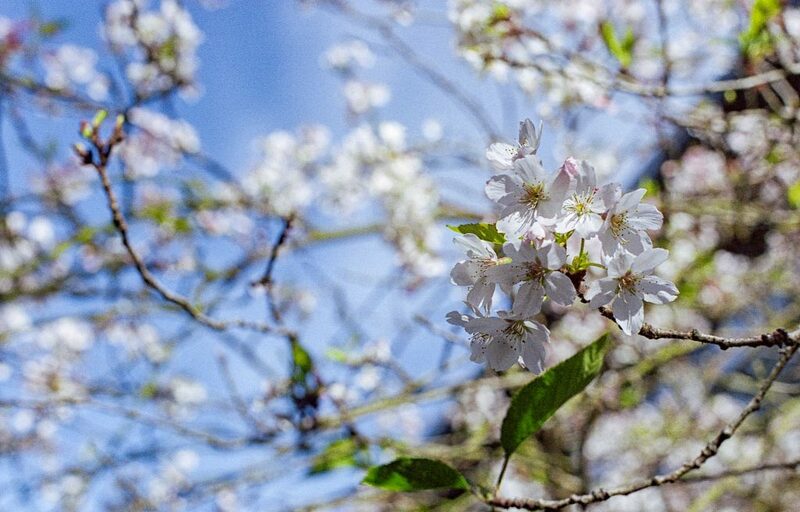 “Cherry Blossom Macro 1” – Canon EOS 650, Canon EF 50mm f/1.4, Portra 400. “Fun Inbound” – Canon EOS 650, Canon EF 50mm f/1.4 USM, Portra 400. 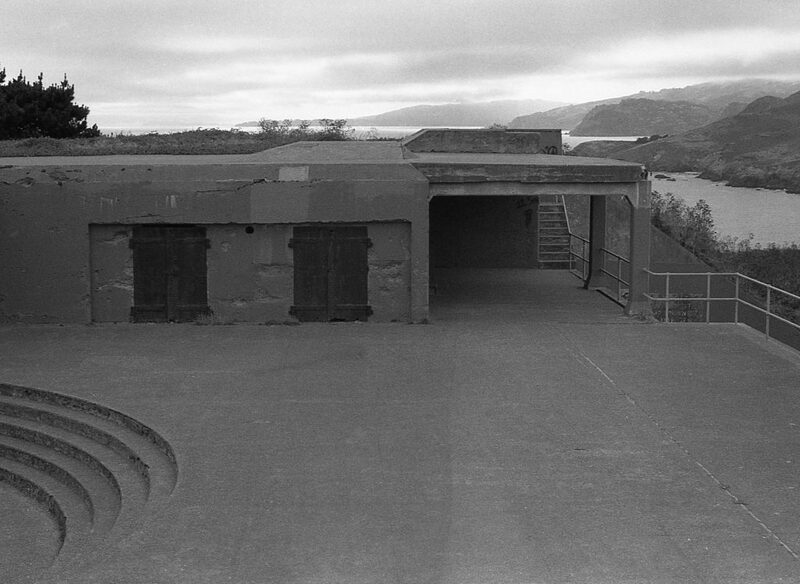 “Base 2” – Canon EOS 650, Canon EF 50mm f/1.4, Ultrafine 400. 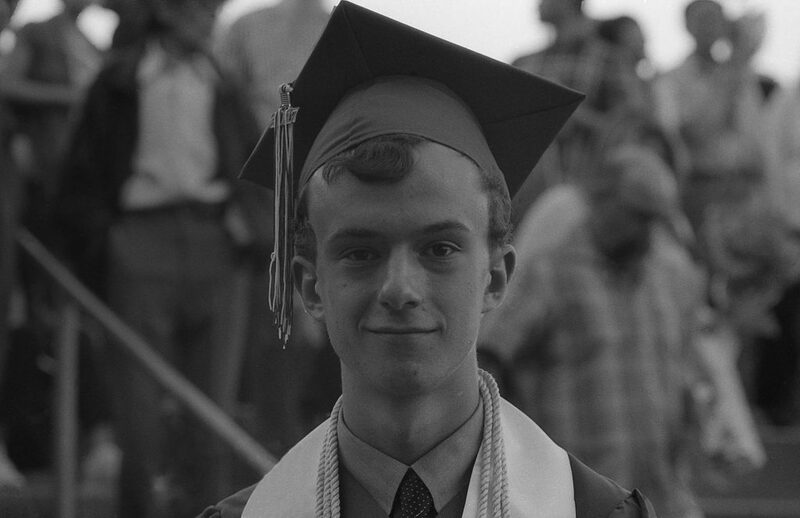 “Frank” – Canon EOS 650, Canon EF 50mm f/1.4, Ultrafine 400. 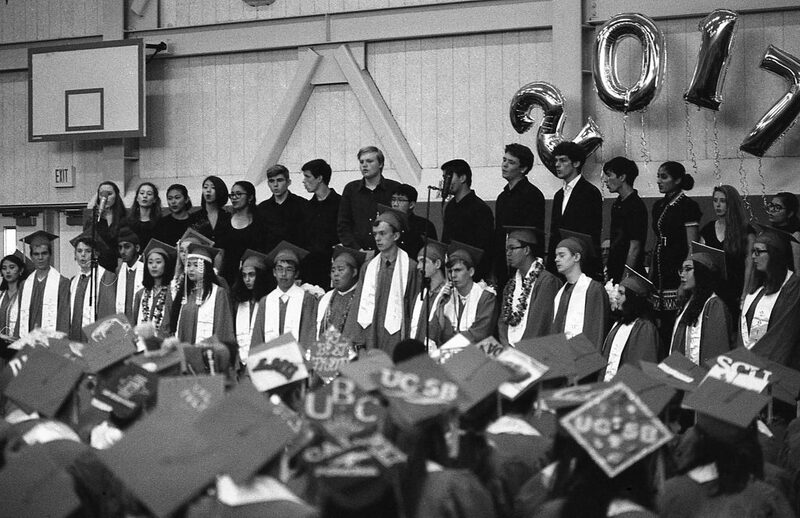 “AHS 2017 Graduation 1” – Canon EOS 650, Canon EF 50mm f/1.4, Ultrafine 400 pushed to ISO 800. 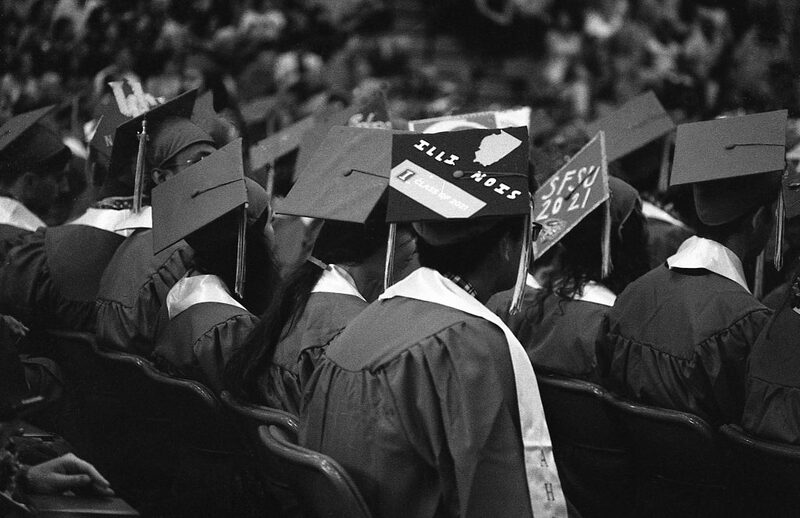 “AHS 2017 Graduation 2” – Canon EOS 650, Canon EF 50mm f/1.4, Ultrafine 400 pushed to ISO 800.